The IFJ Journalism for Tolerance Prize for South Asia is about promoting tolerance, combating racism and discrimination and contributing to an understanding of cultural, religious and ethnic differences. The prize is an annual competition among journalists from all sectors of media with a simple objective: to promote better understanding among journalists from all communities of the importance of tolerance and defence of human rights, particularly when it comes to reporting on minorities. The prize rewards individuals and their work, promoting benchmarks on how to tackle discrimination in whatever form it comes — whether on the basis of language, religion, caste, or ethnic origin. The Prize promotes editorial independence, high standards of professionalism and journalists' ethics, and diversity in media. The Prize for South Asia includes entries from Afghanistan, Bangladesh, Bhutan, India, Maldives, Nepal, Pakistan and Sri Lanka. Prizes will be awarded for different categories of media: print/on-line (including photography), broadcast radio and television. Finalists are short-listed by an eminent jury in from the region. Winners and finalists will receive a certificate of recognition. 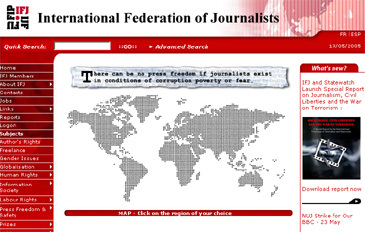 The IFJ is a non-governmental, non-profit organisation that promotes co-ordinated international action to defend press freedom and social justice through the development of strong, free and independent trade unions of journalists. The IFJ mandate covers both professional and industrial interests of journalists. Entries for South Asia will be accepted in English, Hindi, Bengali, Tamil, Sinhala, Nepali, Dari and Urdu. For more information, entry forms or information about the prize including previous winners visit: http://www.ifj-asia.org.